In legal terms, I think that counts as a smoking gun, and ever since that day two weeks ago have tried to do better. I also try hard to put things back correctly in the cupboards and pantry, but in spite of my best efforts, sometimes I slip up. I know this when I hear Mark open a cupboard door or the pantry while I am in another room, hear the soft thud of something falling out – usually on his head – and then the sounds of something akin to “Behold! Yet another Tupperware container hath fallen on my head!” The practical part of my brain realizes somewhere deep down that balancing a bag of flour on a can of soup, and then topping both of them off with a bag of bread or a box of Mac ‘n Cheese is probably not the ideal arrangement for stability, but the other part of me looks at the pantry and can’t figure out any other way to make everything fit. And the Tupperware shelf! Given the various size and shapes of plastic ware available, I am convinced that the people who design plastic ware expect the people using it to have mechanical engineering degrees to get it all to fit correctly. I can match round to round and square to square pretty well, but then you run into oval, oblong, rectangular and super size and any chance of a decent storage system is gone! I try (again) to keep things balanced safely, but every once in a while it seems impossible that it all will fit in correctly, so then I try to mush the unmushable bowl, and the gentle thud will happen soon after. Sigh. 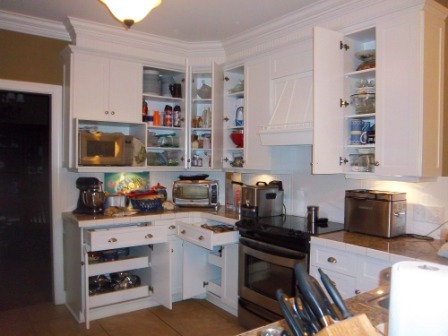 I’m working on it though; at the rate I’m currently going, I should have both the cupboard door problem and the Tupperware organization thing fixed by the time I’m 90 – or I may just borrow my friend Emily’s 11-year-old daughter, who likes to organize kitchens on a regular basis. I’m not sure which! Finally, here are some completely unrelated observations Kayla made this past week. 1) To Mandy: Mandy, stop chasing your tail! You won’t like it when you catch it. Kayla: It lets you call things to you. Mom: Yes, like keys and cell phones. Kayla: I can see where that would be really useful, particular for you. 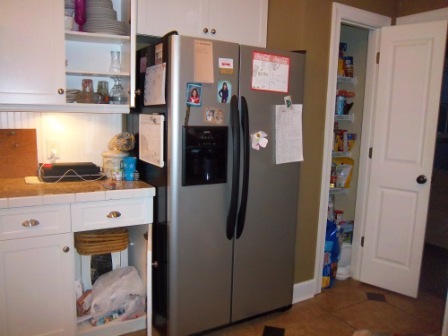 This entry was posted in On the Home Front, working mom and tagged cupboard door, daughter, family, housekeeping, humor, kitchen, working mom. Bookmark the permalink. 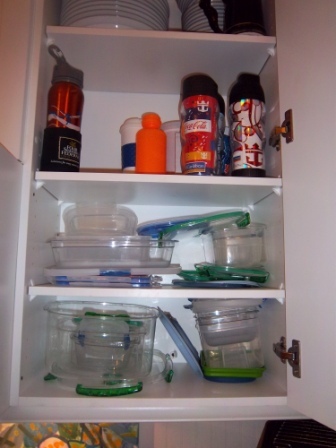 I don’t have a problem leaving the doors and drawers open — our kitchen is galley style and you wouldn’t be able to walk through if anyone did — but I do have a problem with the Tupperware and plastic storage containers. These are normally what end up on the floor when the door is open. I also have a problem stacking my pots and pans so they don’t topple out as soon as the door is open. Yes; Mark announced last night to my Mom, who is visiting, that this post was a confession! Your blog today is my life!!! My bedroom and kitchen look exactly like that…I don’t close drawers all the way to the dresser in my bedroom and I don’t close my closet doors ever! I don’t know where my daughter gets her organizational skills and her desire to have everything in its place b/c it’s certainly not from me!!! !